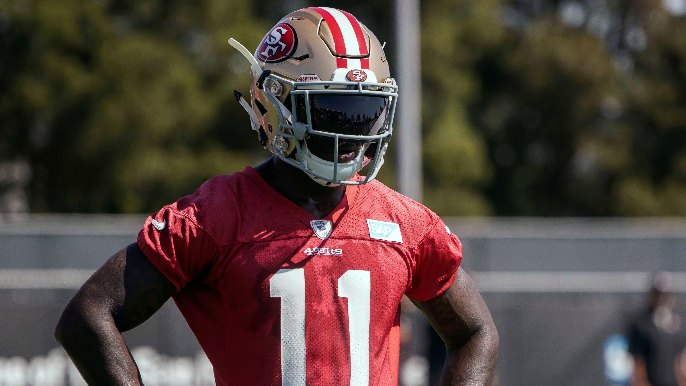 ESPN NFL Insider Adam Schefter joined Murph & Mac on Thursday morning and provided an update on 49ers wide receiver Marquise Goodwin who sat out of last week’s game with a bruised thigh sustained in Week 1. Goodwin was limited in Wednesday’s practice — his first practice since the injury — but Schefter believes we will see Goodwin on the field in some capacity. Goodwin was Jimmy Garoppolo’s favorite target during his 5-0 run to close the season in 2017, and averaged 76.8 receiving yards in those games, and was one yard away for 100+ yard performances in three of them. Garoppolo has been uneven in his first two starts of 2018, and Goodwin’s return will serve as a good barometer on how much his absence has affected the passing game. Listen to the full interview below. To hear Schefter on Goodwin, start from 1:40.